Global Connector Technology’s new range of connectors for solid-state lighting (SSL), dubbed White Lite, specifically targets LED strip applications. They’re able to align center lines of horizontal mating printed-circuit boards (PCBs). The connectors come in two formats: SMT or through-hole with two to six contacts as a two-piece or as a through-hole single-piece solution employing a U-shaped design. U-shaped connectors allow connections where access from above the PCB is the only option. 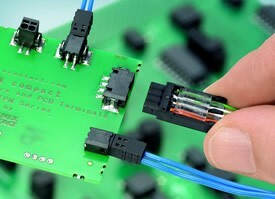 They can be soldered directly to the PCB or plugged into vertical PCB sockets. Liquid-crystal polymer (LCP) insulators feature natural coloring to reduce light absorption. To help speed design, 2D drawings and 3D models can be downloaded from the website.